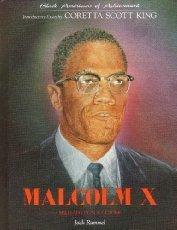 In the "Black Americans of Achievement" series, a biography of a noted black militant of the 60's. Flashing back from Malcolm X's 1964 return from his seminal five-week visit to Africa and the Middle East, Rummel traces his subject's life from a painful, troubled youth and his early adulthood, spent in prison, He discusses Malcolm X's conversion to the Nation of Islam while in prison, including some information on the religion itself and its role in African-American life in the 50's and 60's, and the growing role of Malcolm X as a spokesman for the movement and his eventual alienation from its leader. Final chapters describe his evolving beliefs in traditional Islamic tenets, his founding of the Organization of Afro-American Unity, his commitment to economic and social freedom for blacks (he called for revolt against whites), and his tragic assassination in 1965. While this is useful as far as it goes, and largely accurate (though, unfortunately, a description of Allah as a man is allowed to stand in an indirect quote without correction), Rummel settles for little more than a recitation of facts, without placing them in the perspective of Malcolm X's influence on subsequent African-American political and social life. Serviceable but uninspiring.